Newly appointed Trustee Dave Bergen had just served on the board. The Southold Town Board approved reappointing Republican Dave Bergen to the Board of Trustees, but the decision was not unanimous. During Tuesday night’s regular meeting, Town Board members voted 4-2 in favor of having Mr. Bergen fill a vacant Trustees seat, with council members Jim Dinizo and Jill Doherty, a former trustee, in opposition. “We needed to come to a consensus on a name and that’s what we did tonight,” Mr. Russell said. Mr. Bergen will carry out the unexpired term of Republican Bob Ghosio, who won his bid for Town Board in November and was sworn in in January. Following Tuesday’s vote, Mr. McGreevy said he respects the Town Board’s decision. “I know that Dave Bergen will bring experience, continuity and a renewed sense of purpose to the office,” he said. In November, after Mr. Ghosio won the Town Board seat,Town Board members said they would consider candidates who had previously sought office — namely Democrat Geoffrey Wells, who had lost by a small margin on Election Day 2013 — as well as people with interest and qualifications who have never entered the political arena. During Tuesday’s meeting, Southold Democratic chairman Art Tillman said the Town Board “stacked the deck” against his party and that the Republican committee played large part in the re-appointment of Mr. Bergen. Mr. Russell added that many names had been considered for the position and that Democratic Congressmen Tim Bishop had contacted the town to voice his support for Mr. Bergen’s appointment. Republican Trustee Jim King was pleased the board chose experience over party scuffling. Following the meeting Mr. Bergen, who was not present, said he was “pleased to once again be a member of the Trustee team. Mr. Bergen is not guaranteed a spot on the board after 2014. A special election for the final year of the term will be held this November. TROY GUSTAVSON FILE PHOTO | Rabbit Lane in East Marion was among the streets hit hardest by Hurricane Sandy on the North Fork. 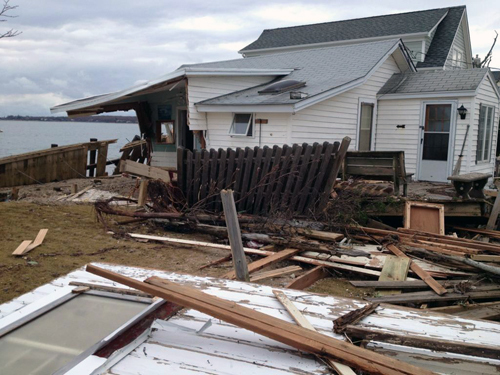 It was a long night for the Southold Town trustees Wednesday, as the board held public hearings on more than 50 applications, most from residents hit hard by Hurricane Sandy who are planning to rebuild bulkheads and decks destroyed in the storm. There were initially 82 applications on the agenda, but many were postponed. Many residents who came in to discuss their projects were caught in a bind because their bulkheads were built before the trustees were given jurisdiction over waterfront properties on the Peconic Bay in 1992. While people who had existing permits for structures built since 1992 were able to get emergency permits to repair hurricane damage, residents with older structures were required to come in for wetland and, if necessary, coastal erosion permits for structures that existed prior to the trustees’ jurisdiction. The trustees started the meeting two hours early, at 4 p.m., in order to deal with the overflow of applications. Many of the permit requests came from residents of Rabbit Lane in East Marion, which saw some of the most extensive damage in town from the storm. Attorney Patricia Moore represented many of those homeowners at the hearings. Mr. King responded that, while the town supervisor could consider waiving the requirements due to the disaster declaration after the storm, the trustees could not make that determination on their own. Applicants who question the trustees’ decisions have a right to appeal their cases to the town board, Mr. King said. Trustee attorney Lori Hulse was skeptical of Ms. Moore’s position. She said that, while the disaster declaration might give the supervisor the right to waive permits for bulkheads and other erosion control structures, it would not give him the right to waive them for decks or bathhouses or other ancillary structures. “I come from the ‘yes we can do it’ mentality,” countered Ms. Moore. Dockbuilder John Costello, who spoke on behalf of many other applicants, said his main purpose in appearing before the board was to get permits to repair bulkheads. Any of his clients could come back later to argue for their decks after their bulkheads were approved, he said. “The last thing I want to be is a lawyer,” he said.